A large section of the mud brick platform in the UM Area was removed to be sure that it was not concealing other brick structures. The fired bricks of the upper buildings measured 7 x 15 x 29 cm (approximately 1:2:4 ratio), while those of earlier buildings at street level measured 6.5 x 13 x 26 cm (also approximately 1:2:4 ratio). 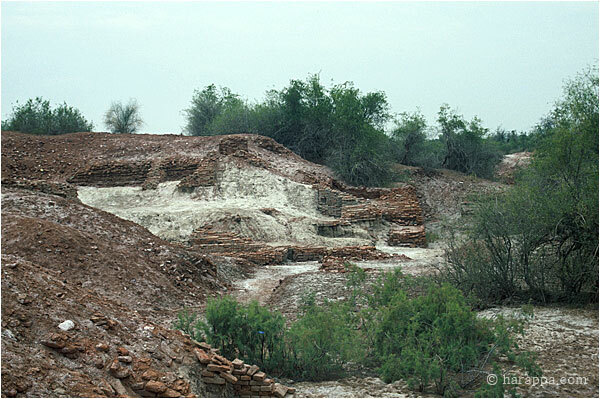 This difference was thought by Dales to indicate a gradual increase in brick size over time, but at Harappa, the opposite pattern is found, with earlier bricks measuring around 7 cm thick while those of the later levels are around 6.5 cm thick.